style="text-align:center;"> Please note that this topic has not had any new posts for the last 2600 days. HERE and use the search option for all your searches. CAG earns a few pennies every time !!! "CAG depends purely upon donations. Please help us to continue helping you, and give what you can"
Advice & opinions given by me are personal, are not endorsed by the Consumer Action Group or the Bank Action Group. Should you be in any doubt, you are advised to seek the opinion of a qualified professional. Commercial espionage is already rife. Google's new privacy(-less) policy will only make it worse. It is becoming ever harder to query Google while staying anonymous. There used to be an anonymising service called Scroogle that proxied Google search requests to maintain privacy. However, after a series of Denial of Service Attacks and Throttling Attacks, waged over recent years by Persons Unknown, Scroogle has finally been forced off the internet. Scroogle vanished completely on 20 February, together with several related search sites. Anonymizing alternatives such as peer-to-peer Tor Onion Routing, and Proxy Chaining are also nobbled by Google. Now, Google queries sent through the anonymizing Tor network routinely result in a sinister Google error message noting "suspicious activity" ! Censorship and State Surveillance are rife today. What started as a slow but systematic erosion of Civil Liberties is now running at break-neck speed. In what must be a world first, internet users in the US and UK now find themselves blocked from visiting certain websites hosted inside P.R.C.! The Parable of the Boiling Frog has finally come true! including age, gender and locality. The new policy which has been criticised by privacy campaigners who have filed a complaint to U.S. regulators comes into affect on March 1. Use the dropdown menu under your name in the upper right hand corner to access your settings. Click On Account Settings Like Below. 2. Next find the section called Services and you'll see a link to View enable or disable web history shown in the red box below. 3. 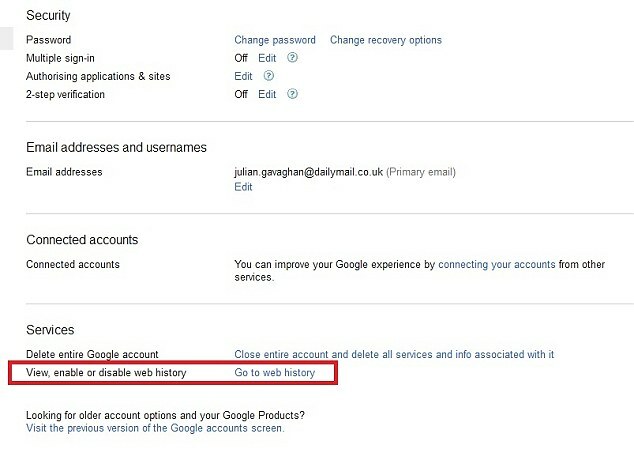 Finally you can remove all of your search details by clicking on Remove Web History shown in the red box below. Once you have done this your history will remain disabled until you turn it back on. it does mean the Web giant will anonymise the data in 18 months. It will also prevent it from certain kinds of uses including sending you customised search results. If you don't sign in Google will track your searches via the computer's IP address. The only way to clear your personal history is by signing in. While it is not known exactly how Google would use your combined information the policy has been widely criticised. The Center for Digital Democracy has filed a complaint with the Federal Trade Commission. It has asked the FTC to sue Google to stop the policy change and to fine the company. The FTC can impose fines up to $16,000 per day for each violation. Cecilia Kang of the Washington Post described collation of vast tracts of information as a massive cauldron of data. Privacy advocates say Google's changes betray users who are not accustomed to having their information shared across different Web sites. she said. into Google's massive cauldron of data or used for Google's maps application. Technology site Gizmodo said that the change was the end of Google’s ‘don’t be evil motto. It means that things you could do in relative anonymity today will be explicitly associated with your name your face, your phone number. It is an explicit reversal of its previous policies. The EU Justice Commissioner has said that the Google Privacy changes are in breach of EU Law. Google are disputing that however and insist the changes comply.